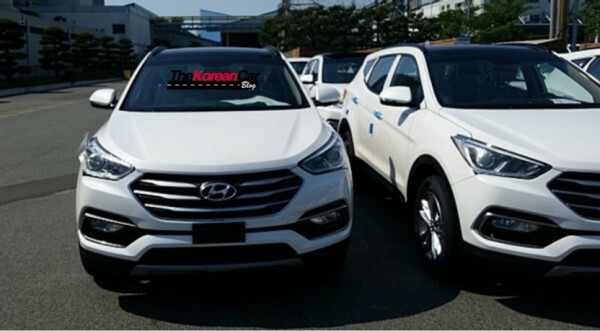 Images of the 2016 Hyundai Santa Fe facelift have been leaked. On the outside, the refreshed, India bound SUV will feature a new Tucson inspired front fascia, which includes a new, triple slat grille, redesigned front and rear bumpers, along with new illumination. New alloy wheels and altered rear lamp clusters round things off. Inside, the 2016 Hyundai Santa Fe will offer an updated infotainment system as well as new trims. Apart from updated engines, the new Santa Fe is also expected to sport something called the “e-4WD” technology, which is a kind of a lightweight hybrid setup that uses a generator instead of a battery to power the electric motors. From what we gather, an electric motor will be mounted on the rear axle, which will transmit power to the rear wheels only, while the petrol engine will power the front wheels. A regenerative braking system to charge the battery with the energy generated at the time of deceleration will also be put to use. The e-4WD system can be selectively controlled from the interior. The e-4WD system is being developed by Hyundai WIA, a member of the Hyundai Motor Group and the 2nd biggest automotive parts manufacturer in South Korea.